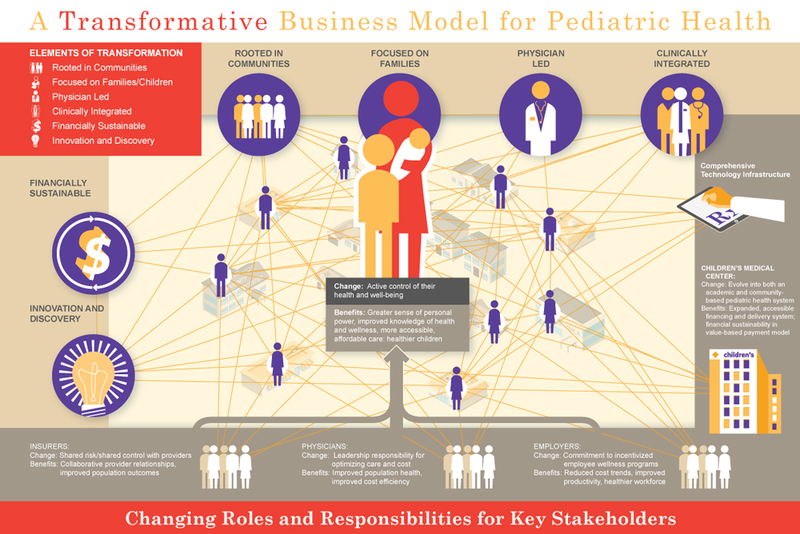 Healthcare has layers of complexity that make it challenging for healthcare providers and suppliers to the healthcare industry to explain its value to its marketplace. The practice itself of course had medical procedures and then layer in the logistics of facilities and suppliers and practitioners to execute on those procedures and finally there are government funding and regulatory bodies that shape the practice as a whole – its easy to see why your buyer might find it challenging to navigate to the point of your offering and how it delivers differentiated value. This is where Frame Concepts can help with healthcare visual solutions. 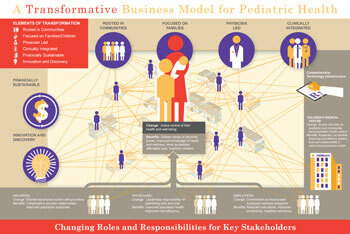 Innovative Healthcare Practices Need to be Shown – unravel the value of your delivery model in one impactful pictogram. Preconceptions Abound – Your not that old antiquated delivery model right? Well then show it. Complex Metrics Require Visualization – your approach improves quality of medical service and is more efficient – a data visualization can bring that to the forefront. 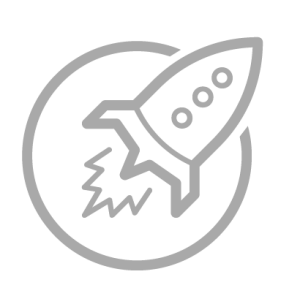 Technology Innovation – a conservative industry with long decision cycles need to see quickly how impactful your new technical solutions will be on bottomline. Conservative Audience Needs to be Shaken Up – the “usual” way of doing things can be sometimes decades old – you have to get them onboard and excited. To see more examples of Frame Concepts Visual Solutions & Content Marketing, kindly view our portfolio. Instead of waiting for incoming patients at the hospital, Children’s Hosptial came up with a new paradigm where they would proactively reach out and educate within the community using the latest technologies. This paradigm shift will lower healthcare costs and increase overall wellness within the community by preventing the cause before it becomes a emergency room situation. 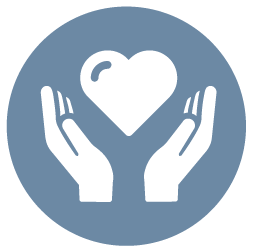 The following pictogram showcases the model and value it has for all stakeholders. 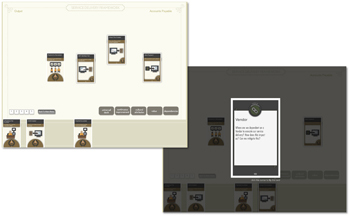 When management decided to reorder their approach to their managed services, they wanted to engage the feedback of its staff so created a interactive card training game where the class gets to discuss the right order and approach while manipulating the service cards. The training tool delivered both on engagement and improvement feedback from those on the frontline. 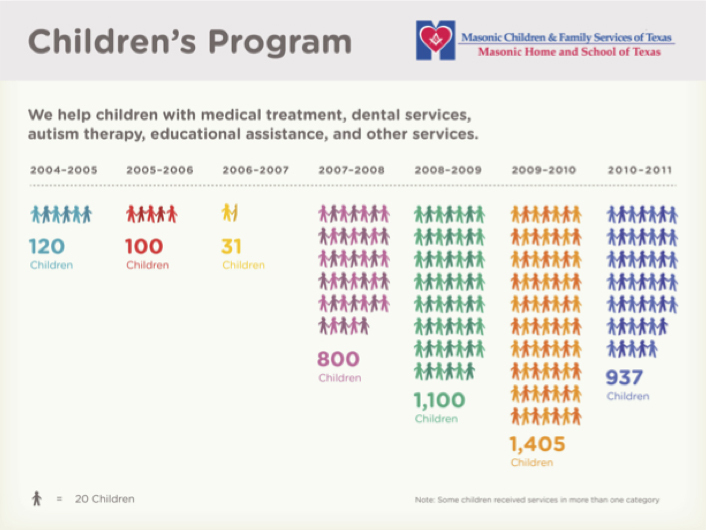 Underprivileged children were not getting the appropriate dental care and the MCFS Charity was making an impact on delivering them into the right hands through the school system. 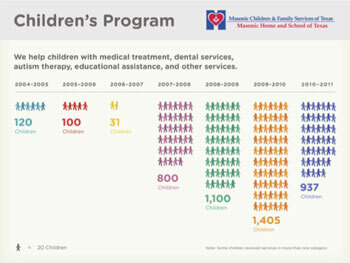 The slide visualization made use of iconography to show impact as well as attract more donations to expand the program.